When I was a licensed bird rehabilitator, someone accidentally left a door open to the room where an injured nighthawk was healing, and my springer spaniel wandered in and picked the bird up in her mouth. Betsy was well bred for hunting, with a very soft mouth, but the poor bird flailed away in a panic, and by the time I heard the commotion and came running, it was breathing its last. I examined its body closely, and although many feathers had fallen out, there were no open wounds. I think the bird simply died of fright. 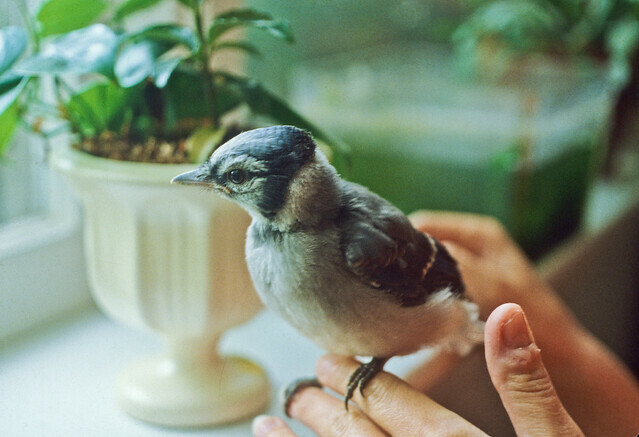 The first Blue Jay I ever cared for was a young fledgling that I rescued from the mouth of a golden retriever. I didn’t know the dog—I’d come upon the scene while walking in a park—but fortunately for the little jay, the dog had a soft mouth and was obedient enough to hand the bird over to me. And equally fortunately, the little fledgling was still too inexperienced to panic, so it didn’t come to the same end as the nighthawk. This bird had a couple of small bleeding wounds, but dog saliva is not as laden with bacteria as cat saliva is. At the time, I didn’t have enough experience to recognize signs of infection, but the bird fully recovered. I’ve heard many accounts of dogs injuring birds, including baby ducks and geese, songbirds, and even hawks and owls that were presumably picked up while hunting or feeding on the ground. Even dogs that don’t chase or kill wild birds can harm them. Running loose in woods or fields, dogs can inadvertently charge over the eggs or chicks of ground-nesting birds. And dogs are especially dangerous on beaches. 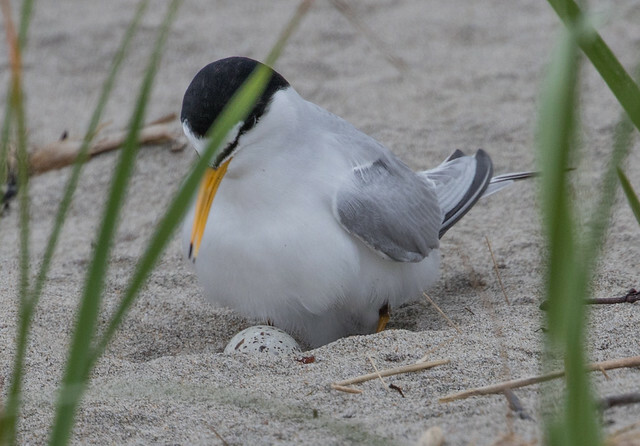 Least Terns and Piping Plovers nest along sandy beaches and dunes, and their eggs and chicks are easily trampled. 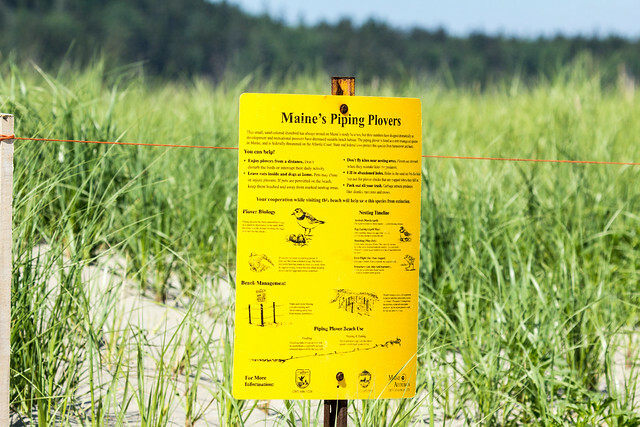 Allowing dogs to run on beaches also leads to dog waste runoff, raising the bacterial load for both birds and humans. Many dogs also like to dig, which can cause serious problems along riverbanks and lakeshores and damage rare vegetation. 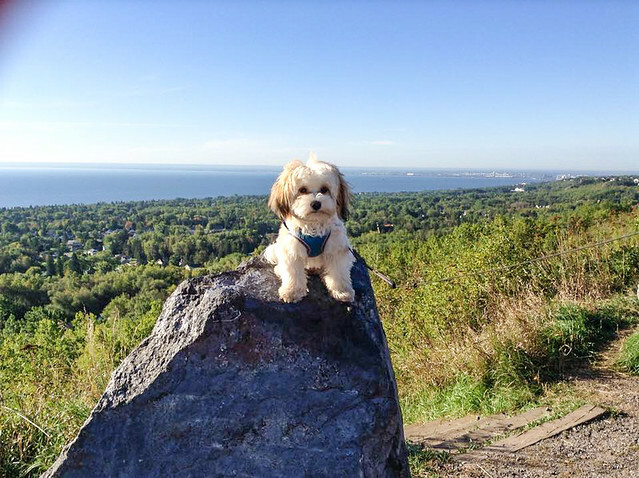 Keep your dog leashed in natural habitats unless it is well trained and comes immediately when you call. Attending a dog obedience class will both make your dog a more pleasant companion and help protect wildlife. Never allow a dog to run loose on any beach where birds nest or feed. Never allow your dog to dig up streambanks or other sensitive habitat or to destroy natural vegetation in vulnerable habitats. Always carry a supply of plastic bags with you for waste cleanup. This will prevent nutrients and disease organisms from running off into lakes and seeping into groundwater supplies. Well-trained dogs are actually quite compatible with birds. I’ve seen a Chipping Sparrow tug at fur from my golden retriever, Bunter. The first two times Bunter was sound asleep, but the third time she was awake, indulgently watching the little bird as if realizing that it just needed some nesting material. 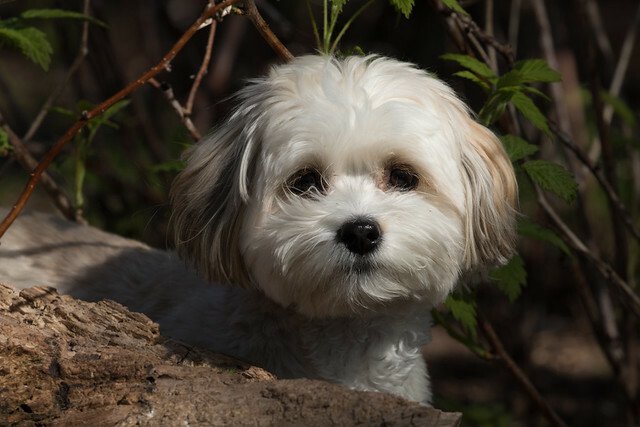 When you brush your dog in spring and early summer, put clumps of fur in a clean suet cage or wedged into tree bark for nesting birds, unless you use Frontline or some other topical flea or tick killer, which may make the fur toxic. RSPB study shows that “dog walking in woodland leads to a 35% reduction in bird diversity and 41% reduction in abundance, both in areas where dog walking is common and where dogs are prohibited. These results argue against access by dog walkers to sensitive conservation areas. *Chicago’s Montrose Harbor, ranked the Number One spot in the state of Illinois for bird migration, has been having dog problems. .